Villa Petroula sits in a private, tranquil countryside position, yet is only 5 minutes' drive from the beaches and amenities of Kassiopi. This harbourside village has plenty of shops, bars and tavernas by the waterfront, and is full of Greek charm with a wonderful, lively atmosphere. This impressive 5 bedroom house has a great outdoor space, with its large private swimming pool, exterior kitchen and sea-facing BBQ terrace at the front. Air conditioning/heating in the lounge and bedrooms, pool heating and WiFi are included. An impressive, private villa in a great countryside position, but with the beaches and facilities of Kassiopi all close to hand! The covered dining terrace sits to one side of the house, and has an impressive stone BBQ and a table and chairs, surrounded by colourful flowers and pot plants. The views from here over the surrounding countryside are simply magnificent, and a flight of stone steps leads through the garden down to the pool terrace. By the poolside is a handy WC and kitchenette with a fridge to store drinks and snacks, as well as a second seating area. An impressive gated, stone driveway lies to the side of the swimming pool where there's plenty of space to park. Steps lead up to the main entrance of the villa on the first floor, and there's also a side gate onto the pool terrace. The large living space combines the lounge and dining area, which has windows along the front wall framing the beautiful views over the hillside to the sea. There is a comfortable seating area with a flat screen TV and ornamental fireplace, as well as a table and chairs. The adjoining kitchen is spacious and well-equipped. From the living area you can access the BBQ terrace. This connects to a wrap around terrace visible from the living space, where you'll find further seating with stunning views. On the first floor is a double bedroom with a dressing area, terrace and en suite bathroom, plus 2 twin bedrooms, a separate bathroom and shower room. One of the twin bedrooms also has a private terrace. Stairs lead down to the ground floor where there is a second double bedroom and a twin bedroom, each with an en suite shower room and shared access to the ground floor shaded terrace. There's also a small office room here. This villa is registered and licenced by EOT Greek licensing association. This number is: 0829K10000382601. 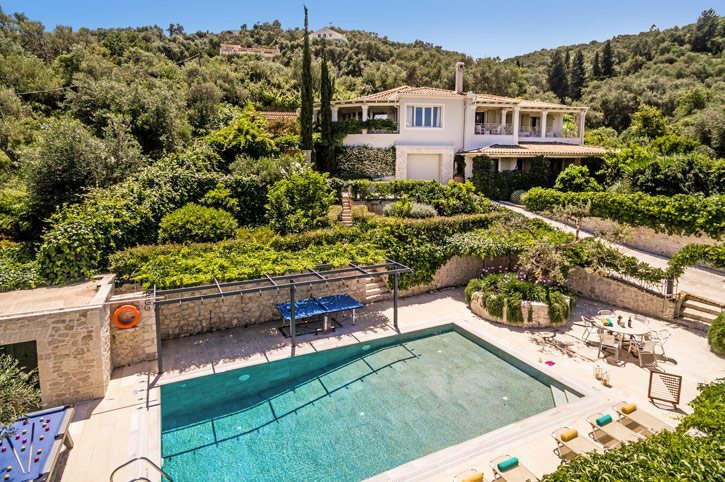 Villa Petroula sits in a wonderful countryside location, but is still only 5 minutes' drive from the amenities of Kassiopi. This lively, vibrant resort is one of the largest on Corfu's north coast and has many bars, shops and tavernas around its central harbour, as well as several good beaches around the headland. There are plenty of activities, attractions and places to visit all within a short drive too. Or, why not hire a motorboat and explore this part of the island from the sea? Kassiopi has several shops selling clothes, souvenirs and beach accessories, as well as a couple of mini markets where you can stock up on daily essentials and BBQ supplies. The island's only market is in the capital, Corfu Town. Here, the stalls sell fresh locally caught fish, vegetables and fruit. The town centre is filled with gift and high street shops which, despite being an hours' drive south, is still well worth the journey. The roads leading into the harbour have a few restaurants, with a greater choice of tavernas and lively bars around the waterfront. Here, there is everything from modern restaurants to traditional tavernas, and popular bars with Greek dancing, karaoke and live sports! The harbour is overlooked by the remains of Kassiopi Castle, which is lit up at night creating a wonderful atmosphere for dining out. There are several great beaches within a very short drive. Kassiopi has a few small pebbly beaches dotted around the headland, as well as the longer Imerolia Beach on the far west side of the resort. All of these have tavernas nearby where you can stop for lunch. The natural beach of Coyevinas is a short drive in the other direction, which has no amenities but is ideal for a picnic. And 5 minutes further is Avlaki Beach which has 2 lovely Greek tavernas right by the waterfront. Children will love paddling and snorkelling in the sea at any of the local beaches and coves. Aqualand Waterpark is an hours' drive towards Corfu Town. Kassiopi Harbour is overlooked by the remains of its impressive castle which can be accessed by a steep, rough track from the harbour. The views from the castle over the village are stunning - well worth the climb! Further afield, and all easily accessed by car, are Corfu's highest point, Mount Pantokrator and the beautiful sandy beaches and views from Paleokastritsa, not to mention various quaint villages waiting to be explored. Or, if you prefer not to drive, why not hire a motorboat locally and explore Corfu's various hidden coves from the sea? Don't forget to take a picnic! Horse riding facilities, water sports and various boating excursions can all be found nearby. And no trip to Corfu would be complete without visiting Corfu Town. Its plethora of shops and restaurants, market, marina and fortresses make it a great day trip. You can even stay into the evening and enjoy cocktails at the Liston - the large central building lined with bars which overlook the fortress. Villa Petroula is not available to book for season as it is sold out. Take a look here at the Corfu villas that are currently on sale. On the main road to Corfu town there are two indoor play parks that are fun for smaller children with bouncing inflatables, padded adventure playgrounds and pleasant cafes.